Your wireless router has a variety of useful options you can configure. These are practically hidden—you wouldn’t know these features exist unless you were digging through your router’s configuration pages. But they’re worth knowing about. Bear in mind that different routers have different options. You may not have all the options listed here on your own router. The options will also be in different places with different names. The vast majority of routers have web-based configuration pages that you can access in your web browser as long as you’re on the same local network as the router. 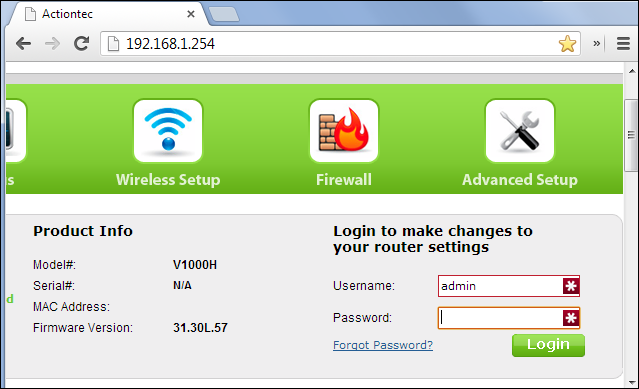 To access your router’s web interface, you’ll first need to find your router’s local IP address. In general, you can just pop open the settings for your network connection and look for the “default gateway,” “gateway,” or “router” entry, but if you have trouble, check out our guide to finding router’s IP address on any computer, smartphone, or tablet. Once you have the IP address, all you have to do is type it into your browser’s address bar and hit Enter. On most routers, you’ll be asked to log in with your username and password combination. If you don’t know these—or you’ve never changed them—your router is probably using its default credentials. Check your router’s manual or perform a web search for its model number and “default password.” If you’ve previously changed the password and can’t remember it, you can reset your router’s password to the default. 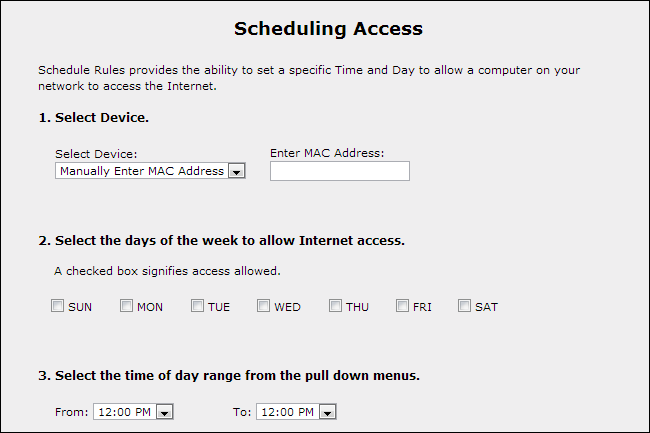 Once you’ve logged in, you can now browse your router’s web-based administration pages and configure its settings. Your router likely provides a way to see who’s connected to your wireless network. You can usually find this option on a general status page or in the wireless section, and the feature will be named something like “client list,” “connected devices,” or similar. If you give your devices and computers meaningful names, this will help you verify that only approved devices are connected. The router’s administration pages also show other information about the Internet connection, including your external IP address (the one the Internet sees), wireless security options, and more. 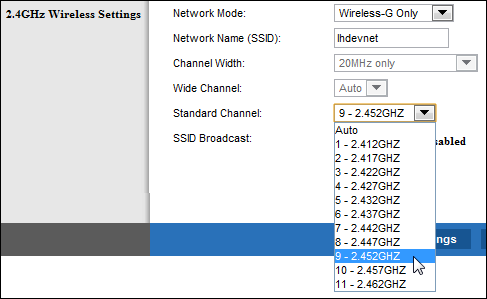 You can modify a variety of wireless network settings in your router’s web interface, including its wireless channel. Changing your router’s wireless channel can speed up your Wi-Fi. If many other wireless networks in your area are using the same wireless channel, interference will result in a slower connection. Before changing your wireless channel, use something like Wi-Fi Analyzer for Android or the inSSIDer utility for Windows. They’ll scan the networks in the local area and find the best wireless channel with the least interference. If you need to create a wireless network covering a large area, one router may not be enough. While you can use tools designed for the job—like range extenders or mesh networks—you can also use multiple wireless routers if you have extras around. But you don’t necessarily want to create separate wireless networks for each individual router. With the repeating feature found on many routers, you can have the router join itself to the main network, functioning as a repeater for that network. This allows you to create one large Wi-Fi network from many different routers. Many routers contain quality of service, or QoS, features. QoS prioritizes traffic to give you a better experience. For example, QoS can reduce the network bandwidth available to BitTorrent transfers and prioritize web pages, preventing your BitTorrent transfers from slowing down your web browsing. This is particularly useful if you have a network with multiple people and want to prevent one bad apple from slowing down the entire network. 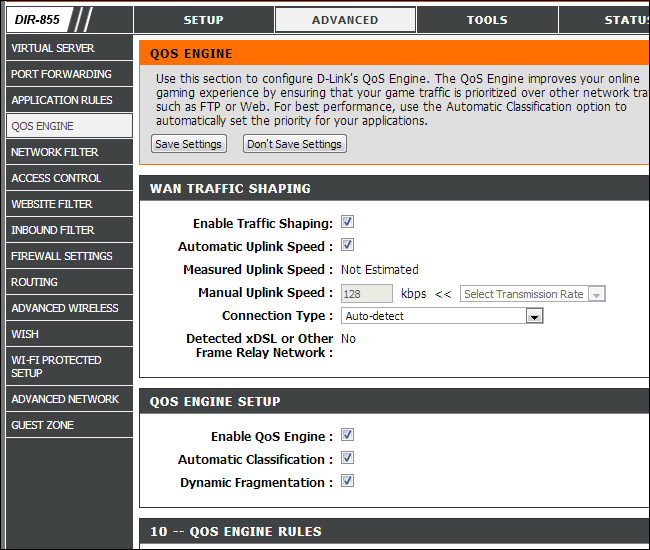 QoS features are often fairly configurable, so you may even be able to prioritize one computer’s network connections over others. If you’re hosting some sort of server on your computer, you’ll need to be able to connect to that computer from over the Internet. However, many ISPs assign dynamic IP addresses that change regularly. Dynamic DNS gets around this by assigning a special address like yourcomputer.service.com to your computer. Whenever your external IP address changes, your router will check in with the dynamic DNS service and update the IP address associated with yourcomputer.service.com, so you’ll always be able to connect to your computer there. 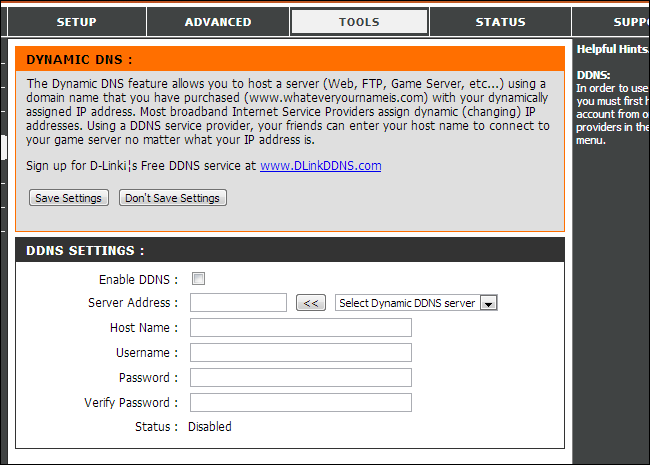 Routers generally have Dynamic DNS or DDNS pages where this feature can be configured. You’ll need to create an account with a supported service and choose a hostname first—check your router’s DDNS page for a list of supported services, and then check out our guide to getting it all set up. RELATED: Do I Need a Firewall if I Have a Router? Because of the way network address translation (NAT) works, routers block incoming traffic by default. If you want to set up a computer as a server or use other services that require incoming connections—such as peer-to-peer file transfers or some forms of VoIP—you may need these incoming connections. Routers provide a variety of ways to enable this. You can forward ports so incoming connections on these ports will always be sent to a certain computer. You can set up port triggering, so port forwarding will automatically be enabled whenever a program opens a connection on a certain port. You can use a demilitarized zone (DMZ) to automatically send all incoming connections on your network to a single computer. UPnP is also generally enabled by default. UPnP allows programs to forward their own ports on demand, although it isn’t very secure. If you’re setting up port forwarding or a DMZ, you should also consider assigning a static IP address so the internal computer’s IP address won’t change and break your port forwarding rules. All of these options—and more—are available in your router’s web interface. You can change the DNS server for your entire network on your router. This allows you to enable parental controls for every device on your network, or just make them use a faster DNS server. There are many reasons why you might want to use a third-party DNS server. Routers often contain parental control features, allowing you to block certain types of traffic or specific websites. You also may be able to control times when Internet access is disabled, preventing your children from using the Internet at 3am. On some routers, you may even be able to configure this on a per-computer basis, limiting only specific computers. Even if your router doesn’t contain parental controls, you can still set up parental controls by changing your DNS server to OpenDNS, as mentioned above. Sometimes, rebooting your router can help fix network issues. You can do this by unplugging the router or pressing a button on it, but the router may be in a hard-to-get-to location. You’ll usually find a convenient button to reboot your router somewhere on its configuration pages, so you can reset your router without even getting up. If you want more out of your router, you can install a variety of third-party router firmwares. You’ll need to have a router that’s supported by these firmwares, so this isn’t for everyone. In fact, if you really want to use these router firmwares, you should take this into account when you buy a router and ensure it’s compatible. Popular router firmwares include DD-WRT, Tomato, and OpenWRT. These firmwares all provide additional options that you wouldn’t normally get on your router. 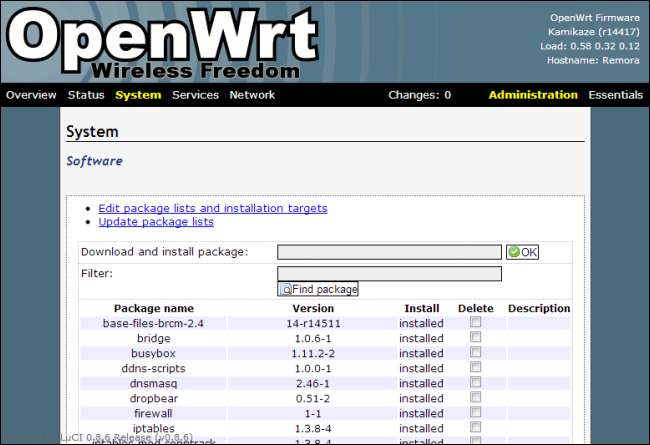 OpenWRT in particular is a full embedded Linux distribution with a package manager, allowing you to access a Linux shell and install software on your router, effectively allowing you to use it as an always-running, low-power server. We haven’t covered everything you can do with your router’s web-based administration pages. 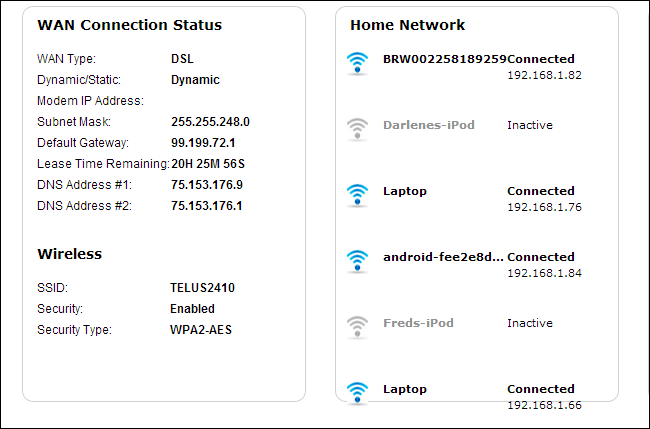 Feel free to take a look around your router’s web interface and see all the options you can configure. You can also consult your router’s manual for information specific to your router model.